Splash in the indoor pool and keep in touch with free Wi-Fi in well-equipped rooms at the non-smoking Sleep Inn & Suites Hannibal. The three-floor Sleep Inn & Suites Hannibal has 67 non-smoking rooms each offering a microwave a mini-fridge a flat-panel TV and free Wi-Fi access. Relax after a day of travel at the indoor pool which has a lift to help those with special needs get in the water or check in with work in the business center and then work out in the fitness room which has a treadmill and a resistance machine. Pets are welcome for additional fees. 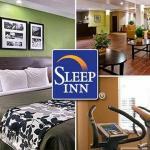 The Sleep Inn & Suites is off U.S. 36 about a mile from the junction with U.S. 61. It's about a 15-minute drive from the Mark Twain Cave Complex and within five miles of the Mark Twain Home and Museum and the Mark Twain River Boat on the Mississippi River/Illinois border. The Molly Brown Birthplace Museum is also about five miles away in downtown Hannibal. Lambert-St. Louis International Airport is 103 miles from the hotel.